Herbs aren't just for the garden and cooking. Herbs are used in a wide range of wonderful gifts that help wellbeing , health and serenity.The use of herbs in gifts goes back centuries, when a posy of sweet smelling herbs was very welcome to take away the less pleasant aroma of ancient drains ( or lack of them) Now you can buy a wide range of herbal gifts that make thoughtful and welcome herbal gifts. There are herb candles, herb soaps, herb bath products, and many more great herbal gifts. Here we point you to a few of the best. Give the healing power of herbs to someone you love. The natural healing qualities of herbs are known worldwide, and the remedies that we now call "alternative therapies" have, in fact been used by many societies for hundreds of years. Lavender has been used since the dawn of civilisation as a soothing herbal balm, and as an antiseptic to ward off germs and plagues. Lavender gifts come in all sorts of formats. I love lavender body lotion to sooth my skin, and lavender room spray for my bedroom. Lavender has the reputation of improving sleep. Peppermint has invigorating qualities, and makes a wonderful soothing foot lotion- a great gift for a busy mom. I also love peppermint tea after a meal. Peppermint tea aids digestion. Of course you can buy peppermint tablets for your digestion, but peppermint tea smells so good. Sage has been thought of as helping improve the brain- the use of the word "sage" to mean a wise thinker comes from this.Lemon balm (or melissa to give it it's proper name) has long been grown to make soothing herb teas.Herbal remedies and natural therapies are excellent gifts for busy women. What could be nicer than relaxing with a soothing herbal bath or body rub? I grow all of these herbs and many more in my herb garden.Herds are so easy to grow. You can find out more about how I grow my own herbs and have fun with growing your own herbs. Not everyone has access to fresh herbs, or to a herb garden, but you can give the gift of herbs in so many ways today. Here I've selected some of the herb gifts that I would love to receive as a gift anytime. All these gifts can be bought online now-so you can shop from home- so soothing! For a really great range of herbal skin products have you looked at skinbotanica natural skin care? They have an excellent selection of organic skincare. Find out more about herbal remedies from these articles. Find out more about this unusual herb. Grow peppermint in your garden. Whilst lavender is soothing, peppermint is invigorating. This article tells you how to grow and use peppermint. There are lots of gifts made with peppermint that I would love to receive. I love rubbing peppermint lotion into my aching feet! A great herbal gift for busy people. Thoughtful gifts for women . There are lots more gift ideas here that I have personally chosen. You can buy top quality dried herbs that come beautifully presented in decorative pots. These are perfect for the woman who actually enjoys cooking, and like to use the very best ingredients. There are also many unusual spa treatments and bath essences that use natural remedies, and these come in very attractive bottles that enhance the bathroom as well as making you feel great. I'm really hoping some of my friends and family take a look here- there are some wonderful gifts here. I'm hoping for a Diptyque scented candle- find more about these luxury gifts , and other wonderful scented candles. I've also showcased pot pourri- dried flowers and herbs that gently release their aroma, making the whole room simply gorgeous. What other herbal gifts can you give to herb fans? What would I like for Christmas or my birthday? Well I love herbs, as I think you know by now. I'd love a great book about herbs. Jekka Mc Vicar's herb books are, in my opinion, the best you can buy. Buy them in book form or for your Kindle. Bubble bath, shower gels, body butter, hand creams- all of these come scented with my favorite herbs, and make great gifts. Think about giving herbs for use in the kitchen- herbs in pots, dried herbs, or even an indoor herb garden would make gifts. I'd also love to receive a selection of herbal teas. Buy the best quality you can, and present a selection of herbal teas in a pretty tea caddy that can be reused and looks great on the shelf. What DON'T I want that's herb related? I don't want tea towels or aprons, thank you! I don't want something that I think of as work related. Herbal gifts should encourage a sense of welbeing and happiness. Jekka's herb books- the best gifts. Lovage and sorrel- two unusual herbs for you to grow. If you're curious about herbs, how about growing these two great herbs? Lovage and Sorrel are two of my favorite herbs. Lovage and sorrel are so underrated, but so easy to grow. Both lovage and sorrel can be used for cooking and for alternative remedies. Why not take a look at these two unusual but very useful herbs? 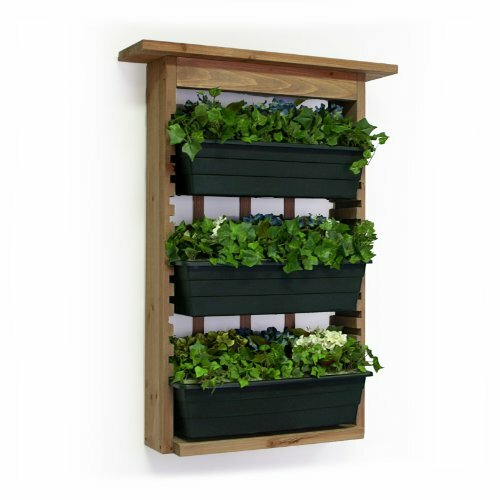 A great gift for herb lovers with very little outdoor space. It's wonderful! This is a Wizzley page. Wizzley is a great way of writing about what you know, and making money as well. Have I given you some ideas for great gifts? I'd love to hear from you. WhiteMoss, Me too, I love seeing lovage and sorrel growing in the meadow and select parts of my natural garden and yard. Surrounding myself with as many indoor and outdoor herbs and as many herbal products, such as candles and lotions, also gives me a cottage and property with acceptable levels of pests since few invertebrates relish getting "stinky" reputation among their peers by bringing back herbal smells. Thanks for your visit. Sorry I took so long to reply! I cannot agree with you more, we have underestimated the healing power of herbs. As an herb lover, I would love any of these as a gift. Thanks for your comments- glad to have given you some ideas! This is giving me some great gift ideas for my mother's upcoming birthday. Right now I'm thinking of the Italian herbs window set for her. Over 3 million visitors a year come to England's Lake District to enjoy the wonderful scenery loved by Wordsworth and the Romantic poets. Take a look and see why .